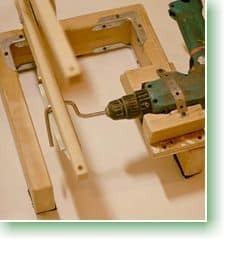 A scroll saw is a small saw that is used for making rather intricate cuts. Some models are pedal operated, while others are electric. It can be used on a variety of materials such as metal, wood, and others. 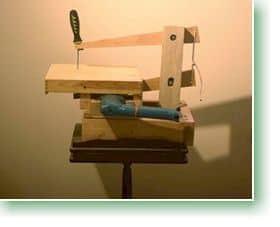 For this project, we'll go over how to make a scroll saw at home from scrap parts. The challenge here is making use of recycled materials (or upcycled materials—use whatever term you are comfortable with). We will have two versions of this project. The first one will have an old jigsaw. The sawing action and drive will all come from the repurposed jigsaw. Old jigsaw (make the necessary repairs to ensure that it is still working). Some hardwood, one of which will be cut into a height of about 190 mm (back piece). This will give the scroll saw some height. As you can see there is a huge square piece that will be cut into shape and the corners rounded off. Sand it off. I used marine plywood for this part. That serves as the main working area. I designed mine to have a total surface area of 150 mm from each side of the blade. A narrow neck was also affixed to it, also made from plywood. To add height to the main working area I used appliance feet attached to wood blocks (I used a pair from a worn down personal fridge). I used another piece of wood to make the adjuster for the tension spring. The pivot arm is made of hardwood. The end of the arm was drilled to fit the blade. Attach the square bar to act as the blade holder. Attach the jigsaw to the bottom of the main work area using screws. If you don’t like the “woodier” design then you can make version 2 look like version 1 except that you will use the combination of a drill and a coping saw. A hand drill, preferably a cordless one that is battery operated or maybe a corded one—depends on which one you have lying around and unused. First, cut out a pair of arms from hardwood (I used oak). Shape them into a parallelogram, to mimic the look and design of a coping saw. Next, disassemble your coping saw. You will only need the blade, the threaded handle, and the end pieces that hold the blade. Cut the slots so that they will angle back. Affix the arms on a length of hardwood using bolts. This hardwood will serve as the post that holds the pair of wooden arms. Here’s an important detail—the distance between the two bolts should be the same as the distance of the pivot pins on the blade. The goal here is to make a parallelogram out of all of these parts. Cut out a main working area from plywood. Make a rectangular frame to serve as the base. The width of the frame should be the same as the width of the main working area. Shape the metal rod into an S shape and fix that on the drill. Out of scrap wood, make a holder for the drill. There is no rocket science involved, but it will require some work. 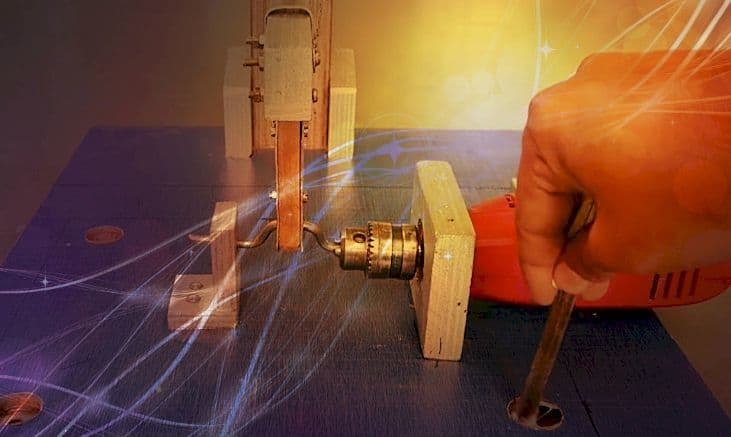 As you can see from the picture above, the drill is on one side of the frame and the parallelogram of wood made of the two swinging arms where the blade will be attached is on the other side. You can make the frame into a solid rectangular shape or you can make it the way as it is pictured above. It’s all up to you. There are no hard and fast rules here. The assembly that’s holding the drill in place is made from three pieces of wood. There is a rectangular base that holds everything together. There are two blocks of wood that hold the drill in place. They have been cut into roughly the shape of the drill. Of course you want the handle and the trigger of your hand drill to be clear of the wood. There should be enough space for you to insert your hand. I also just used a piece of scrap metal on top to hold down the drill. The bar that has been bent into an S shape should be attached to the bottom arm with a piece of scrap metal. As the drill spins this metal, the S shape will drag both arms up and down. If you don’t have any scrap metal lying around, then you can use another bit of hardwood and screw it over the entire assembly. That would make the wood box in the drill. Make sure that this drill assembly is tough since a lot of the action will be coming from the drill. The main work area will then go over the drill and in between the two swing arms. Mark where the blade should go through the main work area and then drill a hole big enough to fit the blade. Affix the main work surface and then slide the blade through the top arm, the work surface and then the bottom arm. Attach the ends of the blade to the ends of the swing arms. 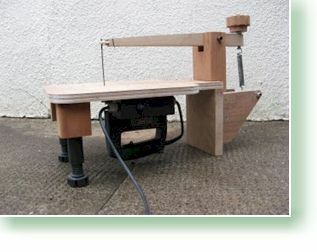 And that’s roughly how to make a scroll saw at home.